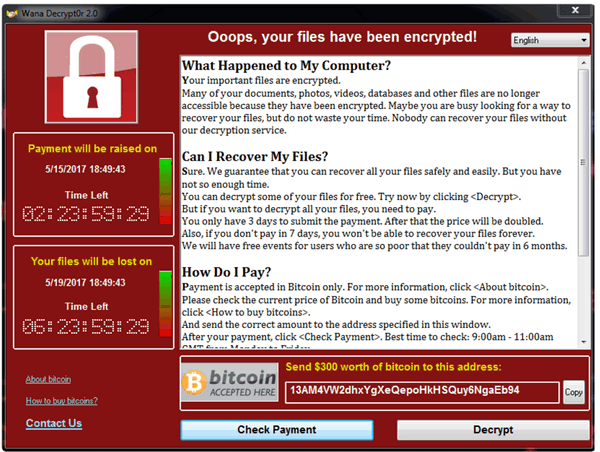 The WCry or WannaCry ransomware is wreaking havoc on tens of thousands of computers around the world including the giant Spanish telecom Telefonica and the National Health Service in the United Kingdom. WCry is also known as WNCry, WannaCry, WanaCrypt0r or Wana Decrypt0r. It was found in early February 2017. It spread to a some computers in March, but now, this week has spread around the globe. WCry will search for and encrypt all user files with the following extensions on all available drives: connected external drives, internal hard drives, connected USB flash drives, and network drives. WCry will charge those infected $300 in Bitcoin to for the decryption key to decrypt their files if the ransom of $300 is not paid in 3 days, it will be doubled. If it is not paid in 7 days, compromised users will not be able to recover their files. The moves came after attackers on Friday used a recently leaked attack tool developed by the National Security Agency to virally spread ransomware known as “WCry” or “WannaCrypt.” Within hours, computer systems around the world were crippled, prompting hospitals to turn away patients while telecoms, banks, and companies such as FedEx were forced to turn off computers for the weekend. Our advice: Keep your files backed up and remember Windows updates are important. Always keep your computer updated and do not turn off Windows Updates, Microsoft patched the vulnerability that WCry uses to encrypt files on Windows 7 computers over two months ago, Windows 10 was never at risk. And use an antivirus / anti-malware that will actually protect you from a wide array of threats. We recommend Emsisoft. We’ve been recommending Emsisoft for over 3 years. We have found it to be best protection and, as usual, Emsisoft was right on top of the WCry epidemic. Those of you who are using Emsisoft are protected from this ransomware by Emsisoft’s Behavior Blocker. It will show you this warning if Emsisoft detects WCry trying to install on your computer. All Windows 7, Windows 8.1 and Windows 10 users who have Emsisoft installed have this extra layer of protection. We recommend that you keep good backups, refrain from clicking links in strange or spam emails and be wary while on the Internet. Make sure Windows Update is on and working, and if you don’t have Emsisoft, you try it free for 30 days. If you want to buy a one-year license, we’ll even install it for you free. Want to know more about WCry ransomware? … WCry ransomware uses a combination of RSA and AES-128-CBC to encrypt the victim’s data. To facilitate this process, is uses the Windows CryptoAPI for RSA, but a custom implementation for the AES encryption. Make sure you are up-to-date with Windows Updates. Keep good backups, And use Emsisoft Anti-Malware – it’s been our number one recommended antivirus/antimalware for over 3 years. Now you can see why we trust the software and the great people behind it. Get more information about Emsisoft here. Or buy a one-year Emsisoft license and we’ll install it and set it up for you for free! Dear Cloudeight : Many thanks for your reassuring info about this malware attack. I was waiting for your comments and you didn’t delay. Since years I trust your advice to keep my computer, an important part of my senior single life, running well and safe. Be well and all the best ! Thank you for this very informative piece. I can always count on you to clearly explain these things and keep us up to date. 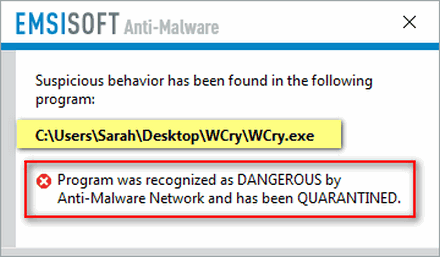 It is good to know that my Emsisoft program protects against this terrible problem. Happy Mother’s Day (if applicable) and thank you for the valuable service you provide to home computer users. I would hate to have to get along without your team.